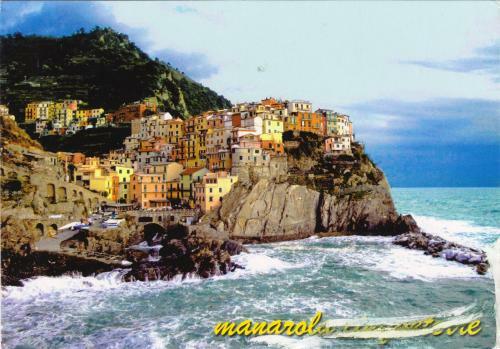 Postcard IT-250393 from Italy shows a view of Manarola, a small town in the province of La Spezia, Liguria, Italy. The second smallest of the five famous Cinque Terre towns, Manarola, along with Monterosso al Mare, Vernazza, Corniglia, and Riomaggiore, is part of a 1997 UNESCO World Heritage Site on a rugged portion of northern Italian coastlines. It could also be the oldest of the towns in the Cinque Terre, with the cornerstone of the church, San Lorenzo, dated from 1338. On June 2 each year, Italy celebrates its National Day Festa della Repubblica (Republic Day) to commemorate the institutional referendum held by universal suffrage in 1946, when the Italian people went to the polls to decide what form of government they preferred, following World War II and the fall of Fascism. The result was 12,717,923 votes for a republic and 10,719,284 for the monarchy.